Quest versus dos Santos: Can Davos make a difference to global inequality? Davos (CNN) -- RICHARD QUEST SAYS: The U.S. bank robber Willie Sutton once famously answered the question on why he robbed banks with the reply, "because that's where the money is." The same should be said for Davos and the issue of inequality. It may stick in Nina's throat but it is an undeniable truth that it is the people who are attending Davos who can make changes. Frankly, no amount of shouting and protesting will make any difference if those in charge of policy and agendas aren't persuaded by the arguments and decide to do something. Can Davos make a difference to one of the world's biggest problems: Inequality? And frankly, when it comes to getting all the right people in the same place at the same time, Davos is unique. In Davos during the WEF we have government heads like David Cameron, Shinzo Abe, Tony Abbott and Dilma Rousseff. These are the people who can actually get something done. There is a reason why Pope Francis sent his Cardinal to Davos, and who gave us the quote of the day when he said we must ensure "humanity is served by wealth and not ruled by it." This was not a quixotic message ... he knows that if he wants to create the change of greater fairness and equality, those who have power must be on board rather than just bleating about unfairness and hoping someone might listen. From the corporate world, there are CEOs here like Muhtar Kent of Coca Cola, Carlos Ghosn of Renault-Nissan, Bob Dudley of BP and Aliko Dangote Africa's richest man. Between them they employ hundreds of thousands of people all across the globe. Their companies set working conditions and wage standards for whole sectors of industry, frequently amongst the low paid. Where they lead others will follow, creating a multiplier effect out of proportion to their individual company. Why so few women at Davos 2014? Then there are the extra governmental groups like the International Labour Organization and NGOs like Oxfam International who push these agendas hard. 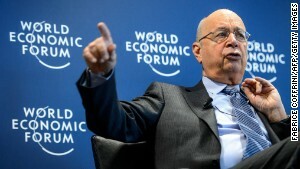 Oxfam International's conclusion that the 85 richest people own half the world's wealth generated huge interest. The director told me Oxfam came to Davos to warn if we don't break out of this power and wealth privilege and opportunity then it "is dangerous." Nina, with all the players in the same place, at the same time this is the perfect venue to raise such issues. Of course there is the risk that leaders and CEOs choose to ignore these calls for greater equality. If they do that they will be closing their eyes to the warnings from groups like the WEF itself. In its latest Global Risks report WEF says inequality is now the greatest threat to global stability. "Income disparity is also among the most worrying of issues. It raises concerns about the Great Recession and the squeezing effect it had on the middle classes in developed economies," opines the WEF. Bearing in mind most companies rely on the middle classes in developed countries to sell goods and services throughout the value chain, dealing with inequality is a matter of brutal enlightened self-interest. It's simple economics: Global stability equals global growth equals profits. So -- Nina -- you tell me a better place where you can advise, consult and ultimately warn those with so much at stake of the risks of doing nothing. Most companies rely on the middle classes in developed countries to sell goods and services throughout the value chain, dealing with inequality is a matter of brutal enlightened self-interest. Or perhaps you would like to stand out in the cold. Talking to yourself. I think I would prefer to talk to those who can actually do something. NINA DOS SANTOS SAYS: From 1,500 meters above sea level you get a great view of the world's big issues. And if you occupy the lofty upper echelons of the ladder -- which many Davos attendees do -- the picture's even clearer right? You see, Richard, while you may consider yourself at home among the world's 1%, the very attributes that make a Davos guest so ideal -- power and money -- often clash with some of the subjects those very delegates are here to tackle. That's especially true when it comes to this year's "theme du jour": Inequality. Of course getting so many of the world's decision makers in the same room affords its opportunities. But when they have a vested interest in maintaining the status quo, you have to ask what appetite -- if any -- they would have for change. Also how credible would their views actually be? Take a look at the thorny subject of executive remuneration, which helps feed today's inequality spiral and should keep the corporate crowd on their toes this year. In the UK, for instance, the average blue chip boss can earn up to a staggering 185 times the salary of their ordinary worker. And in the U.S., the chasm looms even wider. I was surprised to hear the CEO of accountancy firm Ernst & Young confess to me on air that he had never investigated the gap between his compensation and that of his more junior staff. "Should you know this?" I asked. He protested that he created jobs all around the world. As if that, somehow, makes it okay. Job creation is a valid argument but it doesn't detract from the fact that some Davos attendees are so high up the food chain they are either divorced from reality or willfully blind to what doesn't affect them. Until it costs them money or votes, which is why, as you point out Richard, the "squeezed middle" has made its way up the agenda, arguably decades too late. Pope Francis' decision to send a papal envoy to Davos was a game changer this year. But his message -- read out by Cardinal Turkson -- wasn't just about lobbying those in power, it was also about making sure those suffering hardship and financial strain are also represented among the World Economic Forum elites. You see recessions and recovery have a habit of treating the "haves" and the "have nots" differently. And while those further down an organization are more likely to face the ax when times are lean, they don't benefit as much as their bosses when business is better. But don't take my word for it, Richard. Let the figures speak for themselves. Oxfam's report about the top 85 fortunes having a stranglehold over the world's riches has certainly captured public attention but the trend was already well known. A few years ago Branko Milanovic of the World Bank estimated that between 1988 and 2008, around the world, the highest earners saw their income rise by 60% while the lowest 5% haven't witnessed any uptick at all. And that's just income. Don't get me started on the wealth gap, where inheritances, better access to capital and contacts amplify the trend. Richard, you say you would prefer to talk to "those who matter" but I caution you, one can learn a lot from the 99% who actually staff their firms and fund their government's trips to Davos. They do the doing rather than the talking. And guess what? They count just as much. Opinion: Will global elite listen to Pope of poor? Nina dos Santos was in Davos interviewing world leaders by day, mingling at the parties of millionaires by night. So what are they really like? The World Economic Forum usually attracts protesters but this year's were very quiet. So why were they there? IMF chief Christine Lagarde says governments should beware of the global deflation genie coming out of its bottle. A relentless quest for share price boosts can result in disastrous long-term results, writes Andre Spicer. Actress Goldie Hawn says CEOs are discovering how to cope with stress and make better decisions . Richard Quest speaks to U.N. Secretary-General Ban Ki Moon about the progress being made in establishing Syrian peace. Selfie is the word du jour and CNN's Richard Quest set himself a selfie challenge, but which VIPs agreed to pose? Israel's President points a finger at Iran over the carnage in Syria, due to support for Shiite militant group Hezbollah. World Bank chief Jim Yong Kim calls for a concerted global effort to help Syria's refugees, saying the response so far has been inadequate. Richard Quest speaks to Israeli PM Benjamin Netanyahu about why cyber security is so important to the Israeli economy. Think you're paid what you're worth? Explore how your wage compares to the average in your country, then see where you sit globally. Bored by business talk? At Davos? CNN's Richard Quest speaks to Cantor Fitzgerald CEO Howard Lutnick about the lack of a crisis at Davos 2014. Richard Quest speaks to the OECD's Angel Gurria on how inequality and lack of economic growth are tied together. It's town of cuckoo clocks, $20 pasta and very slippery pavements -- tread carefully, warns first-timer Chris Pepper. Nina dos Santos speaks to former U.S. Treasury Sec. Larry Summers who says public sector investment should be encouraged. China: What follows economic power? Almost 40 years and trillions worth of GDP after Mao, an entire generation still has little idea of what kind of nation to strive for, writes Damien Ma. 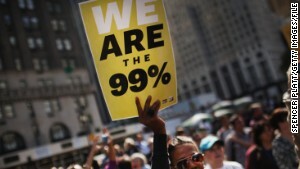 Inequality: Will the rich listen? CNN anchors Richard Quest and Nina dos Santos disagree as to whether this meeting of power players can make a difference to global inequality. The crisis in Syria was front and center for the movers and shakers as Davos formally got underway. Richard Quest heads to Davos, where everyone, it seems, has an event they want him to attend. Read his view of the parties. Richard Quest speaks to European Commission Pres. Jose Manuel Barroso about what can be done about the Ukrainian protests. Is Egypt's dream in the wrong hands? Egypt has entrusted its democracy to the army, the police, a disempowered political class, writes Aalam Wassef. Answer 4 questions to tell us if your mood is up or down, and see how others are responding. Speaking at the WEF in Davos, Japanese PM Shinzo Abe said that by 2020 women occupy 30% of leadership positions. Norway's Crown Prince Haakon says it is dangerous not to let youth help reshape the world, as they have the resources to act. Have leaders failed Dignity Revolution? Three years after the Arab Spring, its issues are back on the agenda and Syrian peace talks have begun. A Tunisian writer says little has changed. Will global elite listen to Pope of poor? Ostentation-adverse Pope Francis has some serious cards to lay on the table in the game of global economic reform, writes John Allen. The World Economic Forum is not just a global gabfest. History is often made there, as Nina Dos Santos reports. We need to invest in human capital to combat a predatory capitalist system, argues Anne-Marie Slaughter. today's emerging markets can be divided into the tortoises and hares, CNN's John Defterios writes. But which will win 2014? CNN's Isa Soares talks to chef Alexandre Kroll about the challenges of cooking for the world's financial leaders in Davos. What's best cure for Europe's ills? Why would a young person with a job, or in education, or training, want to riot and loot, when they have a stake in the future? The small Swiss town of Davos readies for its annual onslaught of world leaders and power players. CNN's Richard Quest says growing income inequality will be high on the agenda at the World Economic Forum. CNN's Richard Quest ponders whether he's climbing a Swiss mountain to learn the meaning of "heterarchy." 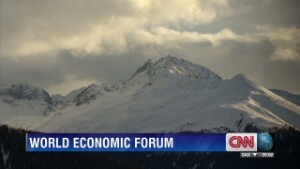 What will business leaders, heads of government, entrepreneurs and celebrities discuss in Davos? Oh, so you want to go to Davos? Davos is invitation-only, but even if you made the cut, could you afford the entry fee? And once there, what do you need to do to fit in?